Cayden Chang came out from disadvantaged childhood, overcame lots of adversities and ultimately founded three companies Mind Kinesis Management Int’l LLP, Mind Kinesis Investments Pte Ltd, Value Investing Academy Pte Ltd which focus on NLP (Neuro-Linguistic Programming) Training and Value Investing Training throughout different parts of Asia. Cayden fought renal cancer twice in a 2nd stage in 2010 and 4th stage in 2014. In 2015, he wrote his 2nd book The Book of Hope: One Man’s Journey Facing Cancer As A Young Husband, Father And Entrepreneur” to raise funds for cancer research for National Cancer Centre. This book tells of his experiences with the disease, including watching his late mother battle terminal-stage lung cancer in 1997. He also wrote “Do You Have What It Takes to Be BOSS” in 2010 and donated all the sales proceeds to ‘The Straits Times School Pocket Money Fund’. Cayden graduated with 3 degrees; a Bachelor of Science degree (Merit) degree, Bachelor of Science (Honours) degree and a Master of Science degree in E-Business from National University of Singapore. He has received the Lifelong Learners Award 2008 from the Minister of Manpower on 18th Nov 2008, Mr Gan Kim Yong. Cayden has been featured widely on TV, Radio Stations, Magazines and Newspapers. And I am glad to finally meet and have him on Rebound Stronger Podcast. 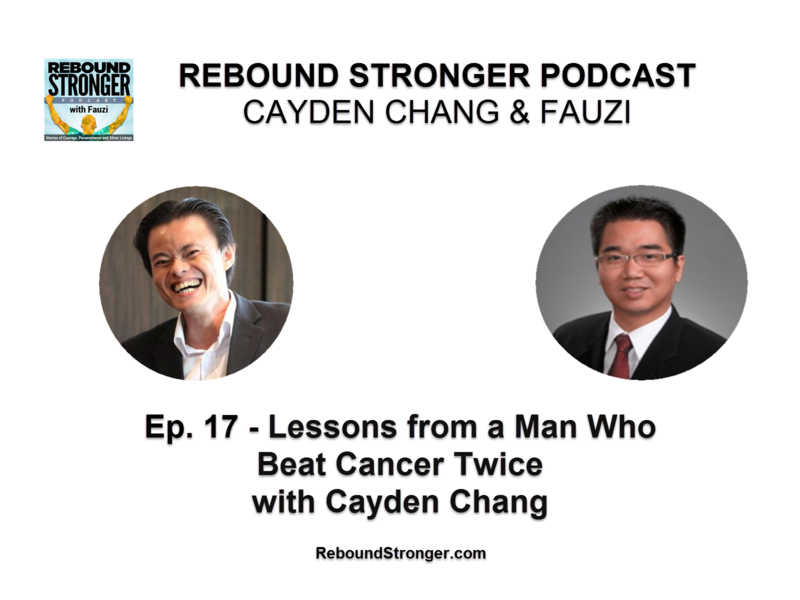 Cayden thank you for sharing your time with Rebound Stronger Podcast listeners. “Nothing else mattered except having time” Cayden Chang when he was first diagnosed with cancer. How did Cayden find out that you had renal cancer in 2010? How did Cayden deal with the shocking news? What Cayden did after the first operation to keep himself healthy and positive? What did Cayden go through from the diagnosis to the recovery of the first cancer? How did Cayden find out about the cancer relapse in 2014 and what happened after that? Cayden biggest take away from these two encounters. How you can make best use of your time. How we can support friend or family who has cancer. Cayden shared his perspective when the person has cancer. Fauzi is consultant at Advisian, an aspiring entrepreneur. He hosts Rebound Stronger Podcast which focus on sharing key lessons from overcoming various adversities. He interviews various successful people with powerful and inspiring coming back stories.